Inflatable sumo costume is a blow up, fat and funny costume for wearing as Halloween costume or just for fun. All adults and kids, men and women, boys and girls, can wear this air blown sumo costume to be the spotlight of any party and festival. Those Japanese sumo wrestler costumes are blown up by inbuilt fans which are powered by batteries. They are easy to put on and take off. 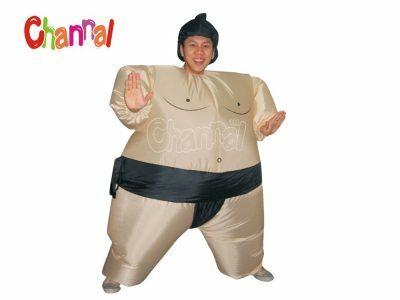 Channal Inflatables is a professional inflatable sumo costume manufacturer in China, you can buy cheap wholesale sumo costumes from us. You may also look for sumo wrestling suits.